The South African Vegetarian Potjie is a classic and traditional Afrikaans recipe, usually made in a cast iron pot over a campfire. This version is basically a vegetable stew, but its how you cook the veggies, and how you present them that really makes them shine. 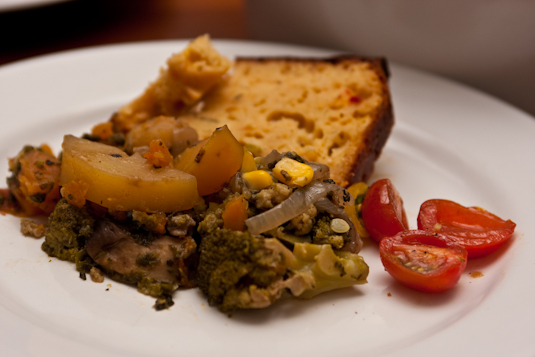 This dish is usually made with lamb or meat, but occasionally you will find a vegetarian version. This is my favourite combination. It is a simple recipe because it comes down to which vegetables are available, and knowing how to combine said vegetables so that they sparkle. Shopping is an integral part of cooking. Organic vegetables are always more expensive (they shouldn’t be but they are!) and so if you cant afford to go all organic, shop smart. Go to the organic section first and figure out what is freshest, ripest, smells and feels the best. Prod and touch and sniff and stroke your vegetables (much like the old lady in Tampopo) and choose a balance of colour and flavour. Max out your budget here, and then round out your vegetable selection with non-organic staples, that might have a larger range or more interesting choices then the organic aisle. The single most important rule to remember when you make potjiekos is to let your imagination, wallet, and the state of your vegetable aisle combine in magical partnership! In terms of the vegetables you use, I would try to remember that you need something from each of these groups: aromatics to pull the entire dish together, such as onions, garlic, or for those who abstain, peppers and celery; starchy and firm vegetables that will standup to being on the bottom of the pot, and will cook the longest; sweet vegetables like pumpkin; vegetables that will release a lot of water, and flavour into the broth like mushrooms or tomatoes; and strong savoury green vegetables. The potjiekos below will feed at least 12 – 16 people, and was made in a 32cm round (not oval) cast iron dutch oven. Get one if you can. Whatever you make in here will feed hoards, and it will last a lifetime. I quite like the smaller oval dutch ovens, but the round one is just fantastic. I chose vegetables that were at their peak in terms of ripeness, luciousness and I tried to include a nice balance of organic and regular vegetables. I used a mix of tastes and textures that I like and enjoy, and layered the roughly chopped vegetables with a sludgey jam that I made from the onions and garlic. I find this is a meditative dish. Cutting the vegetables, layering them, thinking about what goes where and how they will taste with each other – all these processes make you intensely aware of the food you are eating and serving. It’s a loving dish. You can certainly adjust this recipe for much smaller crowds – though if youre cooking for 2 I would make enough for 4, and puree the remainder the next day for a comforting vegetable soup. Potjiekos is beyond delicious! The best part, in my opinion, is the extraordinary, and scant, sauce that pools at the bottom of the cooked dish. It is the essence of the vegetables you used, and needs no seasoning. Sublime. Combine all the ingredients above, in your dutch oven, and cook until the onions are wilted and slightly jammy in consistency. Transfer almost all of this mixture into a bowl, allowing a thin film of oil and onions to remain at the bottom of the pot. Take your pot off the heat. They should cover the bottom of the pot. Mix them with the left over oil and onion coating the pot. and layer on top of the potato mixture. You should almost cover it. Spoon a bit of the onion mixture over this. and layer on top of the butternut mixture. You should almost cover it. Spoon a bit of the onion mixture over this. You could also layer a few fresh herbs – rosemary, thyme, basil – here as well. and layer on top of the mushroom mixture. Spoon over your onion mixture again. Your dutch oven should be full now. If its not, add more vegetables as you see fit. DON’T mix the layers. Spoon over the last of your onion mixture. Either make a vegetable broth with an organic broth cube, or use plain water, add enough water to come about 1/4th of the way up the pot. Cover. Do not stir whatever you do! Check only occasionally as you cook this over a lowish to medium heat for an hour or more. You will know when its ready. Everything will have steamed, lightly. All the vegetables retain their individuality, but the gorgeous elixir which has been created by their mingled cooking steam will unify the dish. It is truly a case of the sum being more than the parts. Check for salt and pepper. To make this look “presentable” and party perfect, sprinkle a few breadcrumbs and over the top for the last five minutes. Pop into a hot oven, with the broiler on. Alternatively, chop up a few bright green asparagus or some broccoli, and put on top in the last 5 minutes. They will stay bright green and make the dish look delicious. Or sprinkle the top with some Italian parsley. Day Two: If you have leftovers, you can do much with this stew. Blend in food processor or blender for a vegetable soup that is beyond delicious. So we are having a feast while watching the England – Chermany game. We knew there was going to be a lot of emotion, and tension, so decided to make lots of delicious comfort food. Salad, with the bessssst salad dressing ever, roasted sweet potato and butter and soy, and angel hair pasta with mushrooms and chili. Lots of posts tonight! Rinse tomatoes and cut in half. Tear salad into bite sized pieces and rinse well. Peel and chop avocado. Slice corn off the cob (tis wonderful raw). Toss in a handful of macadamia nuts. Slice vinegared onions in half, or finely dice half a small onion. 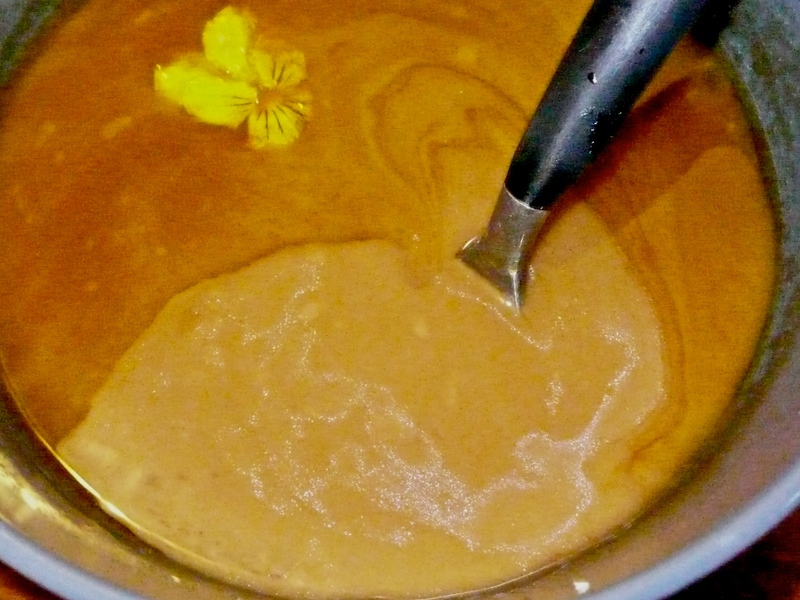 Ensure edible flowers are clean, and add. Toss together, making sure that some of the flowers are face up on top. Mix together well, and taste and adjust to your liking. I adore this sauce. I use it as a dipping sauce for vegetarian chicken pieces or sausages. 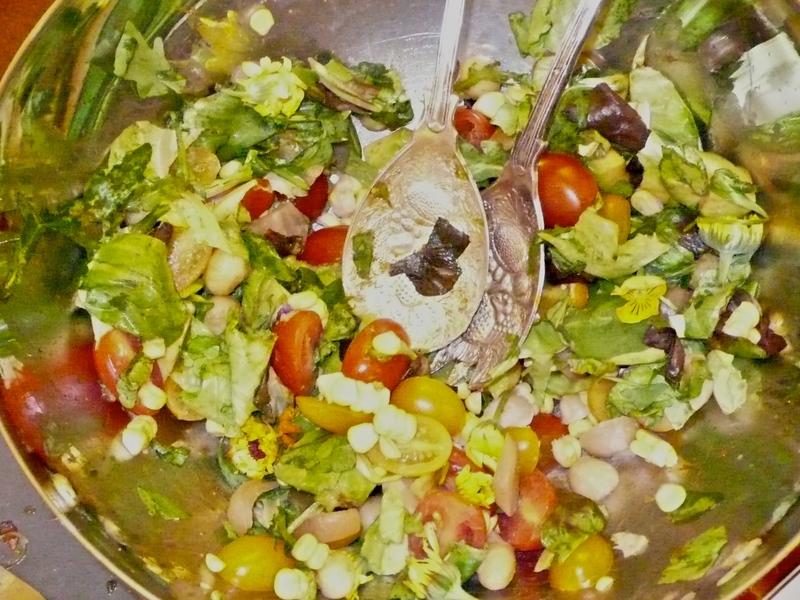 Its great on any salad – from mushroom salad to potato to a wonderful mixed salad as above. You could even use it in a sandwich if you like. You could add some peanut butter for extra protein if you need it. Or some seaweed seasoning. Or toasted sesame seeds. Use your own sense of taste, and what you like, and adapt it for your own pleasure.